Tagensvej 18, 2200 Copenhagen N, Denmark. BACKGROUND AND AIMS: Patients with chronic neck pain can present with disability, low quality of life, psychological factors and clinical symptoms. It is unclear whether patients with a traumatic onset differ from those with a non-traumatic onset, by having more complex and severe symptoms. The purpose of this study was to investigate the clinical presentation of chronic neck pain patients with and without traumatic onset by examining cervical mobility, sensorimotor function, cervical muscle performance and pressure pain threshold in addition to the following self-reported characteristics: quality of life, neck pain and function, kinesiophobia, depression, and pain bothersomeness. METHODS: This cross-sectional study included 200 participants with chronic neck pain: 120 with traumatic onset and 80 with non-traumatic onset. Participants were recruited from physiotherapy clinics in primary and secondary health care. For participants to be included, they were required to be at least 18 years of age, have had neck pain for at least 6 months, and experienced neck-related activity limitation as determined by a score of at least 10 on the Neck Disability Index. We conducted the following clinical tests of cervical range of motion, gaze stability, eye movement, cranio-cervical flexion, cervical extensors, and pressure pain threshold. The participants completed the following questionnaires: physical and mental component summary of the Short Form Health Survey, EuroQol-5D, Neck Disability Index, Patient-Specific Functional Scale, Pain Bothersomeness, Beck Depression Inventory-II, and TAMPA scale of kinesiophobia. The level of significance for all analyses was defined as p<0.01. Differences between groups for the continuous data were determined using either a Student's t-test or Mann Whitney U test. RESULTS: In both groups, the majority of the participants were female (approximately 75%). Age, educational level, working situation and sleeping patterns were similar in both groups. The traumatic group had symptoms for a shorter duration (88 vs. 138 months p=0.001). 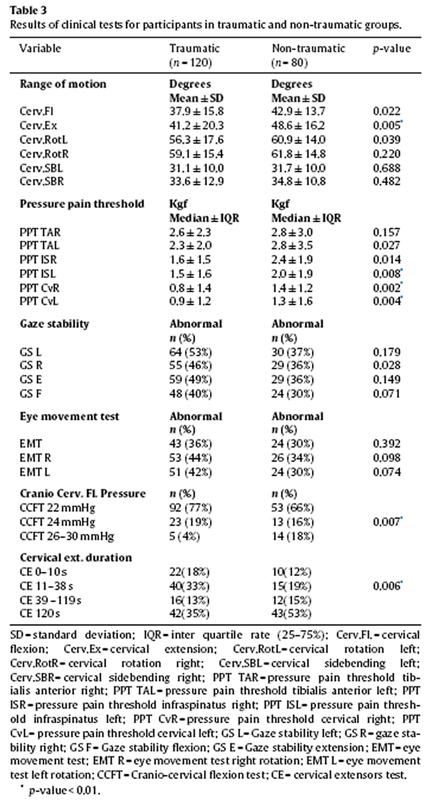 Participants in the traumatic group showed worse results on all measures compared with those in the non-traumatic group, significantly on neck muscle function (cervical extension mobility p=0.005, cranio-cervical flexion test p=0.007, cervical extensor test p=0.006) and cervical pressure pain threshold bilateral (p=0.002/0.004), as well on self-reported function (Neck Disability Index p=0.001 and Patient-Specific Functional Scale p=0.007), mental quality of life (mental component summary of the Short Form Health Survey p=0.004 and EuroQol-5D p=0.001) and depression (Beck Depression Inventory-II p=0.001). CONCLUSIONS: This study showed significant differences between chronic neck pain patients when differentiated into groups based on their onset of pain. However, no specific clinical test or self-reported characteristic could differentiate between the groups at an individual patient level. IMPLICATIONS: Pressure pain threshold tests, cervical muscle performance tests and patient-reported characteristics about self-perceived function and psychological factors may assist in profiling chronic neck pain patients. The need for more intensive management of those with a traumatic onset compared with those with a non-traumatic onset should be examined further. WAD patients have sometimes experienced injustice from their employer, insurance company, or medical profession [29, 41] and been labelled as malingerers. Former studies have focused mainly on whiplash patients or compared this group with healthy controls. Knowledge is lacking about the specific characteristics, similarities and differences of the two groups of neck patients (traumatic/non-traumatic), as they present in clinical practice. In summary, a variety of symptoms are reported in both the traumatic and non-traumatic groups, but it is unclear whether patients with neck pain following traumatic onset differ substantially from those with a non-traumatic onset. This study is cross-sectional, using data originally collected as baseline data for a randomised parallel two-group trial. [43, 44] The participants were recruited from both primary (eight physiotherapy clinics) and secondary health care locations (two spine centres, one municipal rehabilitation centre and one hospital neurological outpatient clinic) in Denmark. Patients were recruited from March 2012 to September 2014. Participants were recruited by physiotherapists and informed about the study via in-clinic advertisements, by their treating clinician or at their first contact with the health care unit. able to participate in an exercise programme. The classification ‘traumatic’ versus ‘non-traumatic’ was based upon the participant’s self-reported cause of their neck pain as traumatic or not. Trauma could relate to traffic accidents or other physically traumatic events. The patients were tested by two trained assessors. The physical tests were performed in the same order for all participants, starting with the least physically demanding test. The self-reported questionnaires were completed during the same test session, after the physical tests. Before enrolling in the study, the participants signed an informed consent form. Cervical range of motion (ROM) was tested in flexion, extension and side-bending using an inclinometer. For rotation, a semi-circular goniometer was placed upon the patient’s shoulder measuring cervical rotation in degrees to the nearest five degrees. Sensorimotor function was tested with two neck–eye coordination tests: gaze stability (GS) testing the ability to keep the gaze fixed while moving the head; and the eye movement test (EMT) testing the ability to move the eyes while keeping the head still. GS and EMT were recorded as positive if the patient experienced dizziness or related symptoms. Cervical muscle function was tested with the cranio-cervical flexion test (CCFT), testing the activity of the deep cervical flexors ; and the cervical extensors test (CE), testing the activity of the cervical extensors during an isometric neck extension. The CCFT scores were divided into three categories: 22, 24 and 26+, as there were very few in the category 28 and 30. CE was grouped into four categories based upon quartiles of the data: 0–10 s (lower quartile) was categorised as poor, 11–38 s moderate (second quartile), 39–119 s good (third quartile), and 120 s was categorised as ideal (fourth quartile). Pressure pain threshold (PPT) was tested bilaterally using analgometer (Wagner, FPX algometer, USA) on the anterior tibialis, the infraspinatus and on the facet joints at C5/6 level. A detailed description of all the clinical tests chosen for the current study is provided in a publication investigating their intra- and inter test-retest reliability. All tests showed satisfactory reliability. The participants’ demographic data including age, gender, type of onset (traumatic or non-traumatic), employment, educational status, and sleeping disturbances were recorded. The size of the population was determined by a power calculation of the accompanying randomised controlled trial. Potential sources of bias caused by mass significance were addressed by choosing a very conservative significance level (p < 0.01). The participants were stratified according to the onset being traumatic or non-traumatic. The assessors did not know the research questions for the study and were not blinded to the origin of the chronic neck pain (as they stratified the participants being traumatic or non-traumatic for the interventions). All continuous data were checked for normality using Shapiro Wilks test and QQ plots. Differences between groups for the continuous data were determined using either a Student’s t-test for normal data or Mann Whitney U test for non-normal data. For the ordinal data, a chi-square test was performed to determine differences between groups and if the minimum expected frequency was less than five in a cell, the Fisher’s exact test was performed instead. Due to the large number of comparisons, the level of significance for all analyses was defined as p < 0.01. All statistical analyses were performed using the Statistical Package for Social Sciences (version 22.0.0, IBM, New York, USA). Two hundred participants were included: 120 with traumatic onset and 80 with non-traumatic. In the traumatic group, 90 (75%)had experienced a traffic collision while 30 (25%) had trauma of another kind. 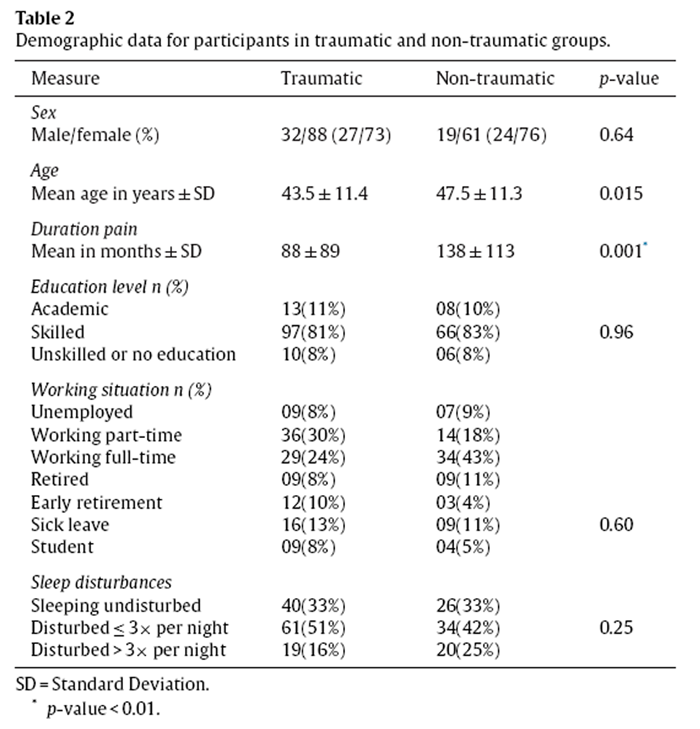 In the traumatic and non-traumatic groups, the majority of the participants were female (approximately 75%) (see Table 2). The traumatic group had symptoms for a shorter duration (88 vs. 138 months p = 0.001). All physical tests showed poorer results for the traumatic group (Table 3); there was a significantly decreased ROM on extension of the cervical spine and significantly lower PPT at left infraspinatus and cervical spine sites. In addition, the traumatic group had significantly lower scores on the CCFT and CE tests, indicating diminished function of the cervical flexors and extensors. 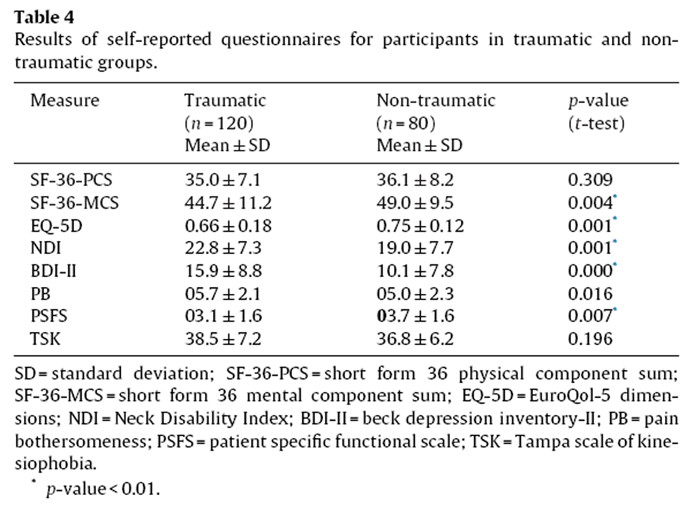 The traumatic group scored worse on all questionnaires, significantly on SF–36 MCS, EQ-5D, NDI, BDI-II and PSFS. Scores on the SF–36-PCS, TSK and Pain Bothersomeness showed no statistical significance although TSK scores were high (37 or more) in both groups (Table 4). In this cross-sectional study investigating the differences in clinical presentation between chronic neck pain patients who had atraumatic versus non-traumatic onset, we found that the traumatic group was worse on most variables and significantly worse on cervical extension ROM, cervical PPT, muscle function, quality of life, self-reported mental function, and depression. The significantly poorer results in the traumatic group may also relate to more severe lesions of the cervical spine due to trauma. Patients with a traumatic onset can have a variety of lesions in the cervical spine. A systematic review, looking at cervical spinal injuries, concluded that it was reasonable to assume that non-fatal road traffic traumas may result in patho-anatomical lesions similar to those in fatal road traffic traumas. But, there is still no consensus on the degree of patho-anatomical changes and their possible influences on symptoms. The impact of such lesions on muscle performance and cervical mobility is therefore an area for further research. We measured a consistently lower PPT in the traumatic group at the cervical spine C5/6 level and for the left infraspinatus muscle, but not for the tibialis anterior. This differs from a study of healthy controls, chronic WAD and idiopathic neck patients  that showed lower PPT for the WAD group at the tibialis anterior, but not for the cervical spine muscles while the infraspinatus site was not tested. This divergence from the results in the current study may be explained by the fact that their participants had shorter duration of symptoms (idiopathic group 3 months until 3 years, WAD group 3 months until 2 years) compared with our group (mean duration symptoms non-traumatic group 11.5 years months and traumatic group 9.5 years). The self-reported health results of the traumatic group showing worse scores on the SF36–MCS, EQ–5D and BDI–II are in-line with those of Guez , a study including 4,415 participants in north Sweden, who found that those with neck trauma perceived their health to be worse than those with a non-traumatic origin. The self-reported psychological changes of our participants mirrored former studies that showed traumatic patients rating themselves as being more forgetful and less able to concentrate , as well as scoring higher on depression [20, 73] than non-traumatic neck patients. Depression appears to be an important influencing factor to perceived health and quality of life  and is seen in patients with chronic pain and traumatic neck pain. [75, 76] Depression is, as such, one of the characteristics of chronic neck pain patients. However, the exclusion in our study of those with severe depression (BDI–II > 29) was based upon the fact that pain patients with severe depression have poor response to treatment  and might need treatment for depression before physiotherapy treatment can have any effect. There are several strengths to our study. We included a large number of participants and recruited the participants from different clinical settings across Denmark. The testing of the outcome measurements was performed by only two assessors: one was the main author of the related reliability study and was, therefore, experienced and rigorous with the test procedures; the other performed the tests on a monthly basis and maintained a close familiarity with the procedures during the whole period. Despite recruiting from different centres, data collection was performed with the same test equipment. The built environment was similar across the settings used for the data collection. Our study also had some limitations. While recruitment of the participants was based on well-defined inclusion and exclusion criteria, the clinical tests and questionnaires to include participants were performed by different physiotherapists at different centres and this may have introduced some variability due to potential cluster effects. Some of this variability may have been minimised due to all physiotherapists being trained in the procedures by the same instructor, but other cluster effects may have been present. The classification of neck pain into traumatic or non-traumaticonset was based on the participant’s own perception. This judgement may contain some imprecision as the pain onset could have been trauma-related, but the patient did not recognise this, or the neck pain was incorrectly ascribed to trauma. It is unknown whether the recall of trauma is related to the present severity of the condition and future studies should examine this. This study was conducted using data collected as part of a randomised controlled trial. The inclusion criteria for the trial related to the duration of pain (more than 6 months), the severity of symptoms (NDI ≥ 10), and the willingness and ability to take part in an exercise programme, all of which may have influenced the results of this study. As the classification of neck pain into traumatic or non-traumatic onset was based on patient self-report, these inclusion criteria for the trial were unlikely to have influenced the comparative results. There are several potential implications of our study. Chronic neck pain patients ought to be given proper attention in primary and secondary care as they are affected by their symptoms. Those with a traumatic onset may need more attention, presenting similar symptoms but at a worse level. The notion that the traumatic group, being a group with merely psychological problems was not confirmed, as there were no distinctive psychological test results or self-reported characteristics of this group compared with those with non-traumatic onset. Screening of different physical functions, particularly muscle-function and PPT may assist in profiling the patient. The question as to whether this would assist in clinical decision-making needs additional investigation. Both groups had high scores on the kinesiophobia scale (traumatic mean 38.5, SD7.2; non-traumatic mean 36.8, SD 6.2), indicating a high degree of kinesiophobia. This should lead to a focus on addressing kinesiophobia in the management of chronic neck pain patients, regardless of the cause of onset. Clinicians should also consider addressing factors such as quality of life, self-perceived level of function and depression in chronic neck pain patients. Further research should focus on the results of treatments directed at these characteristics. In summary, patients referred to physiotherapy with traumaticand non-traumatic chronic neck pain shared common clinical characteristics, but objectively measured physical impairments as well as self-reported health impairments were more severe in the traumatic group. However, both groups had a high degree of kinesiophobia. Our results showed more severe symptoms in the traumatic patients as a group, but these results cannot influence individual patient clinical decisions on their own. Further studies should explore the effect of different management strategies on the varying symptoms of both groups. This study found that patients with chronic neck pain with atraumatic onset in general were worse than those with pain from a non-traumatic origin on both the physical tests and self-reported health characteristics. There were no exclusive characteristics foreither group, and both groups presented a large variety of signs and symptoms. The trial was registered in www.ClinicalTrials.gov (NCT01431261). The Regional Scientific Ethics Committee of Southern Denmark approved the study (S-20100069). The study fulfilled recommendations of the Declaration of Helsinki 2008 . The authors declare that they have no competing interests. The Nordic Institute of Chiropractic and Clinical Biomechanics and AK’s position at the University of Southern Denmark are financially supported by the Danish Chiropractic Fund for Research and Post-graduate Education. This study received funding from the Research Fund of the Region of Southern Denmark, the Danish Rheumatism Association, the Research Foundation of the Danish Association of Physiotherapy, the Fund for Physiotherapy in Private Practice, and the Danish Society of Polio and Accident Victims (PTU). We thank the staff involved in recruitment and testing, and the participating patients at the Spine Centre of Southern Denmark Hospital Lillebælt, the Spine Centre of Regional Hospital Silkeborg, the Rehabilitation Centre of the Odense Municipality, and the Neurological Outpatient Clinic of Southwest Jutland Hospital, as well as at the physiotherapy clinics involved. We also thank Karina Agerbo, Bibi Gram and Rene Jørgensen for helping with data collection and Suzanne Capell, an academic editor, for providing English language and grammar assistance. Hogg-Johnson S, van der Velde G, Carroll LJ, Holm LW, Cassidy JD, Guzman J,Cote P.
Patientprofilen hos Praktiserende Fysioterapeuter iDanmark. In: Region Nordjylland RM, editor. Guez M, Hildingsson C, Nilsson M, Toolanen G.
The prevalence of neck pain: a population-based study from northern Sweden. Neck pain and disability due to neck pain: what is the relation. Expectancy, fear and pain in the prediction of chronic pain and disability: a prospective analysis. Thompson DP, Urmston M, Oldham JA, Woby SR. The association between cognitive factors, pain and disability in patients with idiopathic chronic neck pain. Carroll LJ, Holm LW, Hogg-Johnson S, Cote P, Cassidy JD, Haldeman S, NordinM, Hurwitz EL. Berglund A, Alfredsson L, Jensen I, Cassidy JD, Nygren A. The association between exposure to a rear-end collision and future health complaints. Curatolo M, Petersen-Felix S, Arendt-Nielsen L, Giani C, Zbinden AM, RadanovBP. Koelbaek JM, Graven-Nielsen T, Schou OA, Arendt-Nielsen L.
Generalised muscular hyperalgesia in chronic whiplash syndrome. Sensory hypersensitivity occurs soon after whiplash injury and is associated with poor recovery. Banic B, Petersen-Felix S, Andersen OK, Radanov BP, Villiger PM, Arendt-NielsenL. Sterling M, Hodkinson E, Pettiford C, Souvlis T, Curatolo M.
Psychologic factors are related to some sensory pain thresholds but not nociceptive flexion reflex threshold in chronic whiplash. Scott D, Jull G, Sterling M.
Widespread sensory hypersensitivity is a feature of chronic whiplash-associated disorder but not chronic idiopathic neck pain. Carroll LJ, Hogg-Johnson S, van d V, Haldeman S, Holm LW, Carragee EJ, HurwitzEL. Jorritsma W, Dijkstra PU, De Vries GE, Geertzen JH, Reneman MF. Physical dysfunction and nonorganic signs in patients with chronic neck pain: exploratory study into interobserver reliability and construct validity. Evans R, Bronfort G, Maiers M, Schulz C, Hartvigsen J. Neck pain: much more than a psychosocial condition. Sensory hypoaesthesia is a feature of chronic whiplash but not chronic idiopathic neck pain. Altered motor control patterns in whiplash and chronic neck pain. Elliott J, Jull G, Noteboom JT, Galloway G.
MRI study of the cross-sectional area for the cervical extensor musculature in patients with persistent whiplashassociated disorders (WAD). Sullivan MJLP, Adams HBSW, Martel M-OB, Scott WBA, Wideman TBPT. Catatrophizing and perceived injustice risk factors for the transition to chronicity after whiplash injury. Guez M, Brannstrom R, Nyberg L, Toolanen G, Hildingsson C.
Neuropsychological functioning and MMPI-2 profiles in chronic neck pain: a comparison of whiplash and non-traumatic groups. Sjolander P, Michaelson P, Jaric S, Djupsjobacka M.
Sensorimotor disturbances in chronic neck pain, range of motion, peak velocity, smoothness of movement,and repositioning acuity. Verhagen AP, Lewis M, Schellingerhout JM, Heymans MW, Dziedzic K, de VetHC, Koes BW. Do whiplash patients differ from other patients with non-specific neck pain regarding pain, function or prognosis. Jull G, Kristjansson E, Dall’Alba P.
Impairment in the cervical flexors: a comparison of whiplash and insidious onset neck pain patients. Represas C, Vieira DN, Magalhaes T, Dias R, Frazao S, Suarez-Penaranda JM,Rodriguez-Calvo MS.
No cash no whiplash? Influence of the legal system on the incidence of whiplash injury. A cross-cultural comparison between Canada and Germany of symptom expectation for whiplash injury. Sterling M, Hendrikz J, Kenardy J. Compensation claim lodgement and health outcome developmental trajectories following whiplash injury: a prospective study. When range of motion is not enough: towards an evidence-based approach to medico-legal reporting in whiplash injury. Côté PSH, Ameis A, Carroll L, Mior M, Nordin M, the OPTIMa Collaboration. Enabling recovery from common traffic injuries: a focus on the injured person. Chronic whiplash syndrome. Psychosocial epidemic. The whiplash encyclopedia: the facts and myths of whiplash:. Myrtveit SM, Wilhelmsen I, Petrie KJ, Skogen JC, Sivertsen B. What characterizes individuals developing chronic whiplash? The Nord–Trondelag Health Study(HUNT). Kivioja J, Sjalin M, Lindgren U. Psychiatric morbidity in patients with chronicw hiplash-associated disorder. Joud A, Stjerna J, Malmstrom EM, Westergren H, Petersson IF, Englund M.
Healthcare consultation and sick leave before and after neck injury: a cohort study with matched population-based references. Bostick GP, Brown CA, Carroll LJ, Gross DP. If they can put a man on the moon,they should be able to fix a neck injury: a mixed-method study characterizing and explaining pain beliefs about WAD. Bostick GP, Ferrari R, Carroll LJ, Russell AS, Buchbinder R, Krawciw D, Gross DP. A population-based survey of beliefs about neck pain from whiplash injury, work-related neck pain, and work-related upper extremity pain. Scott W, Trost Z, Milioto M, Sullivan MJ. Barriers to change in depressive symptoms after multidisciplinary rehabilitation for whiplash: the role of perceived injustice. Hansen IR, Sogaard K, Christensen R, Thomsen B, Manniche C, Juul-KristensenB. Neck exercises, physical and cognitive behavioural-graded activity as a treatment for adult whiplash patients with chronic neck pain: design of a randomised controlled trial. Ris I, Søgaard K, Gram B, Agerbo K, Boyle E, Juul-Kristensen B. Does a combination of physical training, specific exercises and pain education improve health-related quality of life in patients with chronic neck pain? A randomised control trial with a 4-month follow up. Rubinstein SM, Pool JJ, van Tulder MW, Riphagen II, de Vet HC. A systematic review of the diagnostic accuracy of provocative tests of the neck for diagnosing cervical radiculopathy. Jorgensen R, Ris I, Falla D, Juul-Kristensen B. Reliability, construct and discriminative validity of clinical testing in subjects with and without chronic neck pain. Jull GA, O’Leary SP, Falla DL. Clinical assessment of the deep cervical flexor muscles: the craniocervical flexion test. Bjorner JB, Thunedborg K, Kristensen TS, Modvig J, Bech P.
The Danish SF-36 Health Survey: translation and preliminary validity studies. Wittrup-Jensen KU, Lauridsen J, Gudex C, Pedersen KM. Generation of a DanishTTO value set for EQ-5D health states. Bunketorp L, Stener-Victorin E, Carlsson J. Neck pain and disability following motor vehicle accidents – a cohort study. Lauridsen HH, O’Neill L, Kongsted A, Hartvigsen J. The Danish Neck Disability Index: new insights into factor structure, generalizability, and responsiveness. Assessing disability and change on individual patients: a report of a patient specific measure. Stewart M, Maher CG, Refshauge KM, Bogduk N, Nicholas M.
Responsiveness of pain and disability measures for chronic whiplash. Pietrobon R, Coeytaux RR, Carey TS, Richardson WJ, DeVellis RF. Standard scales for measurement of functional outcome for cervical pain or dysfunction: a systematic review. Westaway MD, Stratford PW, Binkley JM. The patient-specific functional scale: validation of its use in persons with neck dysfunction. Schnohr CW, LD, Bjørner B.
Oversættelse og validering af en dansk udgave afPSFS (Patient Specifik Funktionel Skala) – et nyttigt værktøj for terapeuter. Cleland JA, Fritz JM, Childs JD. Psychometric properties of the Fear-Avoidance Beliefs Questionnaire and Tampa Scale of Kinesiophobia in patients with neck pain. Jorgensen MB, Damsgard E, Holtermann A, Anke A, Sogaard K, Roe C.
Properties of the Tampa Scale for kinesiophobia across workers with different pain experiences and cultural backgrounds: A Rasch analysis. Stewart MJ, Maher CG, Refshauge KM, Herbert RD, Bogduk N, Nicholas M.
Randomized controlled trial of exercise for chronic whiplash-associated disorders. Young IA, Cleland JA, Michener LA, Brown C.
Reliability, construct validity, and responsiveness of the neck disability index, patient-specific functional scale,and numeric pain rating scale in patients with cervical radiculopathy. Elliott J, Sterling M, Noteboom JT, Darnell R, Galloway G, Jull G.
Fatty infiltrate in the cervical extensor muscles is not a feature of chronic, insidious-onset neck pain. Van Oosterwijck J, Nijs J, Meeus M, Paul L.
Evidence for central sensitization in chronic whiplash: a systematic literature review. Malfliet A, Kregel J, Cagnie B, Kuipers M, Dolphens M, Roussel N, Meeus M,Danneels L, Bramer WM, Nijs J. Lack of evidence for central sensitizationin idiopathic, non-traumatic neck pain: a systematic review. Smith AD, Jull G, Schneider G, Frizzell B, Hooper RA, Sterling M.
A comparison of physical and psychological features of responders and non-responders to cervical facet blocks in chronic whiplash. Dumas JP, Arsenault AB, Boudreau G, Magnoux E, Lepage Y, Bellavance A, LoiselP. Physical impairments in cervicogenic headache: traumatic vs. nontraumatic onset. Sterling M, McLean SA, Sullivan M, Elliott J, Butenhuis J, Kamper SK. Potential processes involved in the initiation and maintenance of Whiplash Associated Disorders (WAD). Curatolo M, Bogduk N, Ivancic PC, McLean SA, Siegmund GP, Winkelstein BA. The role of tissue damage in whiplash-associated disorders: discussion paper 1. Uhrenholt L, Grunnet-Nilsson N, Hartvigsen J.
Cervical spine lesions after road traffic accidents: a systematic review. Guez M. Chronic neck pain. An epidemiological, psychological and SPECT study with emphasis on whiplash-associated disorders. Wand BM, O’Connell N, Parkitny L.
Depression may contribute to the sensory changes in whiplash patients? but not chronic idiopathic neck pain. Borsbo B, Peolsson M, Gerdle B.
Catastrophizing, depression, and pain: correlation with and influence on quality of life and health – a study of chronic whiplash-associated disorders. Do psychological states associate with pain and disability in chronic neck pain patients? Carroll LJ, Cassidy JD, Cote P.